Info: When the Spaniards devastated the Triple Kingdom, the Christian priests burned several bound, painted pictorial books that showed the history and traditions of the native people. Few codices survived this purge. This is one of them. 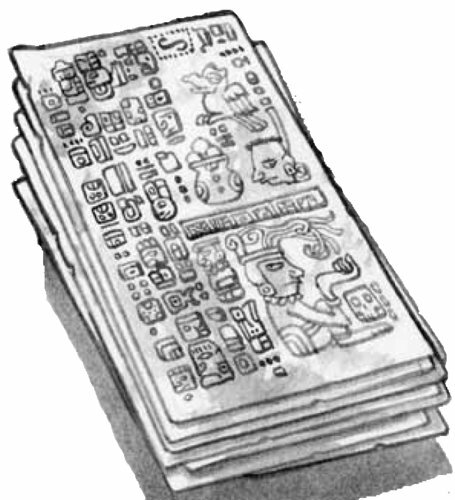 The Codex Ixtlilxochtil is among the older codices, a collection of thin stone plates held together with wire-strength bindings. It illustrates a series of pictures that explain the Aztec (and Maya) calendar(s) and the relation of the gods to various calendar days. It also demonstrates many of the more advanced feats of engineering and technological know-how employed in he making of the impressive metropolises of the now-vanished South American empires. Effects: By following the guided instructions of the Codex (and Instant action) the user can access a series of useful effects, similarly to how referencing a Grimoire allows a mage to use the Rote within without having to learn it first. The Codex can only show one such power’s instructions at a time; the reader must use a Instant action to page through the Codex and find the right instructions if he wishes to use the Codex for a different effect. The Codex is also capable of disguising itself, which may explain why it seems to have survived several conflicts and cultural epochs. With a thought, a touch and an Instant action the owner can change the tome into the shape and format of other objects of information storage around it (scroll, tablet, book, etc), making it blend in perfectly. The reader can still consult it to benefit from its power, but only the effect most recently used or the page currently being read. It needs to be returned to its true form in order to change it to a different 'setting' again.